I'm so excited to be a part of this amazing group of authors (and readers). I look forward to getting to know all of you. I debated about what my first blog topic should be. Should I tell you a bit about myself, or wax poetic about my latest writing project or perhaps venture into my (vocal) opinions regarding my favorite movies and TV shows (something I will probably be doing a lot in coming months). Then I realized, I can do all three by telling you a bit about the movie that turned me in to a lover of romance. No, it's not STAR WARS, although that turned me into a lover of Han Solo (who's with me on that?). This is the movie, that if I was stranded on a desert island (with electricity! ), I'd bring a DVD of (or store on my tablet of choice). It's a movie that I've owned on VHS, DVD, and digital format. If I'm flipping channels and come across it, I stop. It's impossible to switch off. It is my go to for a romance reboot, and it never, ever disappoints. It also illustrates that I'm more of an old-fashioned geek than you might expect a child of the 70's to be. 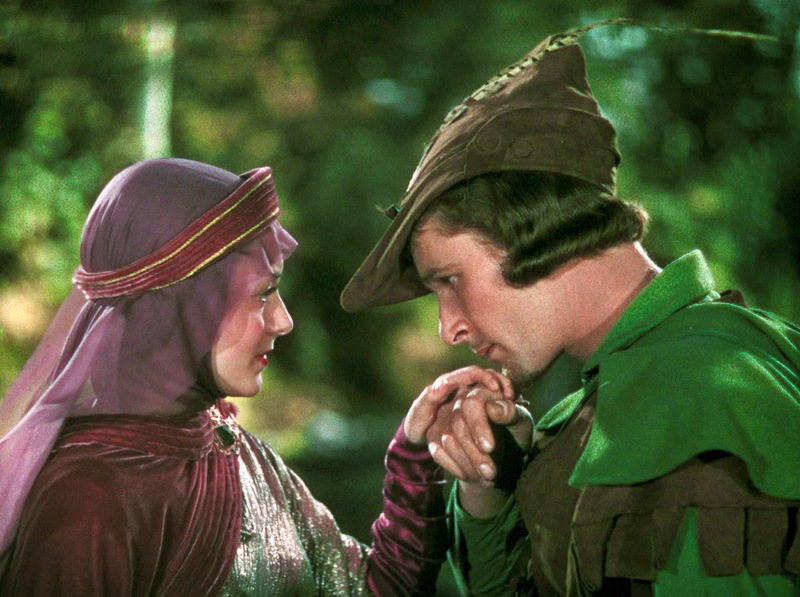 Weaned on classic Hollywood movies and Saturday morning movie-a-thons, there's only one film it could possibly be: The Adventures of Robin Hood. 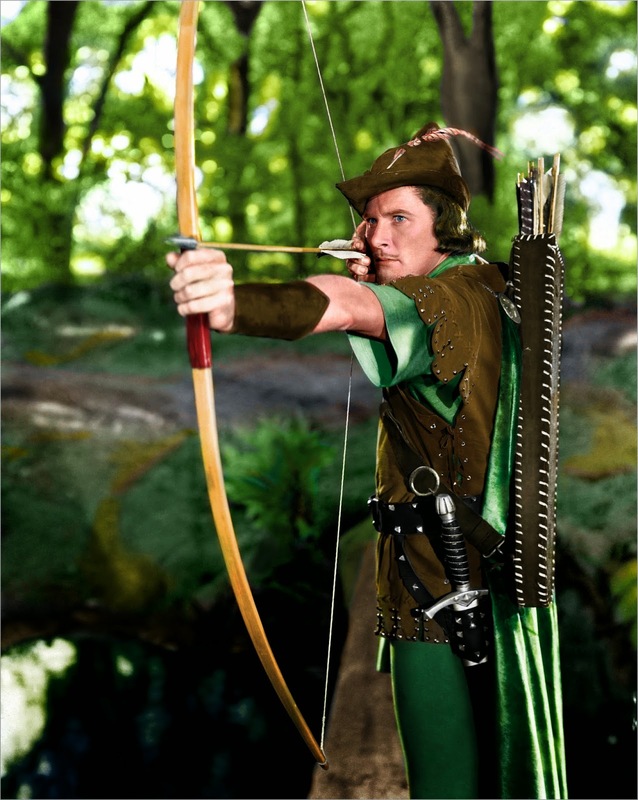 Yes, I mean the classic Robin Hood--the Errol Flynn version (which in my mind is the only one that counts). Long before I dreamed about writing, I fell in love with falling in love and there isn't a movie that exemplified that fall more than this movie (at the time). Yes, there's adventure and action and a cast of crazy, fun characters, there's also solid story telling with all the elements we writers are told to behold. But at its core, there's Errol Flynn as Robin of Loxley, fighting for the forgotten and abused, fighting the system and setting Sherwood Forest on fire with all those sparks with Maid Marion. Seriously, no one kissed a woman's hand like this guy. But I digress. Ask any of my writer friends and they'll tell you, I'm a fan of the spitfire heroine. It's what I write and what I prefer to read. You know the kind of heroine I'm talking about: the kind you don't have to worry about because she can take care of herself. At a time this movie was made (1938), strong, independent heroines got a bad wrap or were made out to be the "bad girls", but Olivia deHaviland's Marion broke the model. Or maybe it's that she established it. You can see these two falling for each other from each stubborn look to a simple kiss of the hand. Now that I write sweet romance (along with other genres), I see that this movie hits all the emotional buttons I want to hit as a storyteller. If you think the lesson of this movie is don't mess with Robin, I might take issue and claim that Marion more than holds her own. Also, would they have defeated Prince John without her? 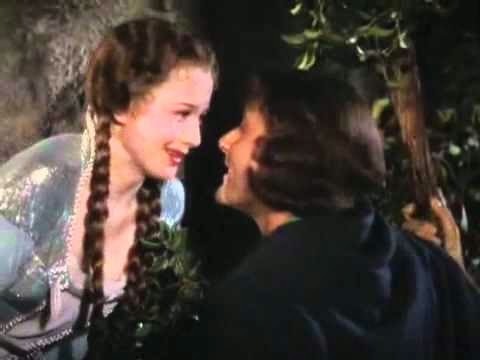 When I think back to my early days of reading and writing romance, I often call on those twisty, turny, squishy feelings I still get when I watch the interplay between Errol Flynn and his heroine of choice (he and Olivia made a lot of movies together--and their chemistry is evident in every single one). Thank you, Hollywood, for giving me the gift of this movie (and so many others). In fact, I think it's time to pop this puppy in the DVD player again...cause I feel like falling in love. USA Today & National Bestselling author Anna J Stewart writes sweet romance for Harlequin Heartwarming and contemporary romance for Berkley InterMix. Feel free to drop by her website to read more about her and her books and to join her mailing list--you never know what you might win just by subscribing! I'm with you on this, Anna. I love this movie and I've seen it more times than I can count. There are many movies I love from this period, but this is one of my favorites. Great job for your first blog! Thanks so much for stopping by, Patricia. :) Good to know I'm not the only one who gets pulled into the Robin Hood vortex. Such a fun post, Anna, and welcome to the group! Some of the "oldies" are the best movies for rekindling that feeling of true romance. I must watch that, have never seen it! And welcome to SRR! I was never a John Wayne fan, but The Quiet Man grabs me every time! I was never a John Wayne fan, but The Quiet Man gets me every time. There is a spitfire heroine!